Comments: First off I am so glad you guys check up on me!! And yes they are amazing. I can now hold an alignment!! Comments: Very tight fit but overall very impressed stiffened up my rear end a lot and created a noticeable difference. Comments: Part fits, great quality. Awesome service. Comments: They have been in my car for 2 years but honestly only driven for one and I miss them I need to buy some for my db8. Comments: I am OK with the part and think its a great part. Comments: The best handling improvement on my wagon especially for hard launches. Comments: Bushings are still holding up great! I daily drive my civic through all weather and still handles great. No complaints. Comments: They are still holding up okay. Theres couple wear but should hold up fine still. hopefully. Comments: Definitely recommend using the specific honda extractor tool for replacing. Getting them back in required an air hammer, but Im sure it could be done with patience and elbow grease otherwise. I dont expect to have to replace these again for the life of the car, They have held up just fine. I got the black ones for whatever thats worth. Comments: Works great, no problems, no noises. Comments: I have been using energy bushings for years and the quality, installation information, durability and ride quality is always the best. Comments: Still as good as new! Very happy with this product. Comments: An awsome, much needed part for older civics, Made all the differance in the repair of my 97! I would deffinatly reccomend this product to others interested in keeping a older car on the road longer. Comments: I built a press using two large pieces of flat steel and all thread with a nut and washers. You need a torch and a knife to get the old bushings out, using a saw blade is a joke. I left my brakes attached and dropped the arms and propped them up to burn out the bushings. took abt 1hr 20min each. A grinder and a wire wheel reay helps clean the center section up fast. Bushings really helped reponse and straighten out the tires. Comments: Bushings were easy to install. Oem bushings wore out fast. Great product, good ride and handling upgrade. Comments: Good replacement if you have the time and tools to do this job. Took me about 6 hours and alot of power tools. Installing these wore me out!!!! Comments: Good quality, 10x stronger and stiffer that the factory suspension. Tough to separate and reuse some of the factory parts, specially the center mounting bracket. It Improved my driving quality. Comments: Awesome part just cut the old bushing out or burn it out. Use the lube supplied and you do not need a special tool like forums tell you just line it up and push it in with your hands make sure to leave it in the trailing arm though I did it and I am only 16! Great Product car rides a lot better now! Comments: Improved overall handling and comfort of car. It was a lot easier to install than I thought. I just removed the trailing arm, used the hammer to hit out the arms, burned the rubber in the old grill and installed the new bushings. It took me 4 hrs, and I was done. Comments: After a whole year with these new trailing arm bushings in, I cant imagine what it would be like to go back to the stock rubber ones. The first time I got in the car after installing these there was a very noticeable difference in smoothness of ride and increased turn-in response. I still feel the difference with no diminished quality. Recommended purchase! Comments: This product is worth 5 stars! Comments: The trick to install these is to use a propane torch and roast the heck out of them. You have to keep the metal sleeve the bushings sit on so don't overdo it. To install while on the car use a big C clamp and push it in then shove the metal bar back in. Your done! Using silicone grease not petrol based will ease the process. Comments: Very easy to install the bushings.Not the first time I have purchased them. I refer and recommend these parts to others. Comments: love the product really happy with the outcome. Comments: They were easy to install and work great better then the factory ones i am very happy the ride is smooth and i've bought most bushings and parts since installing these best parts i've bought in a while. Comments: Must have pin from original car. Comments: Cutting the old worn bush out is quite time consuming but once done, fitting the poly bushes is easy, found warming them up really helped and pushed them in by hand! The handling of the car is fantastic now. Comments: These parts went onto our Integra Type R race car. They made a huge difference in our last race at California Speedway. Thanks again! Comments: Very strong and effective! Energy Suspension are easy to install, just read the manual! thank you very much. Comments: Parts arrived promptly, price reasonable, will definitely buy from this vendor again. Comments: Top materiel and simple to install. Comments: These make your car handle so much better. A+ product. Comments: Like always, products are in very good condition, shipping is fast to Serbia. Love to work with this people. Comments: Great product, excellent results. Only bad part is removing the OEM bushings. Comments: Nice part, easy install. Wish it came with the metal cross piece. Had to blast and powder coat mine. Comments: A nice part, but be careful, this replaces the keystone in Honda's rear double wichbone design. About the quality of the item itself after about 50000 km and a few experiences I can say they are top. Anyway if you change OEM ones for this be prepared to change the way the car feels quite dramatically. All the rear wheels movement that are designed to be there by Honda, e.g. toeing in during brake to aid stability, will almost completely be locked. So if you know about handling and want the car to do exactly what you want everytime, this is the product you're looking for, but if you're only looking for a replacement of the OEM one for your commuter Civic, well, probably this isn't what you're looking for. 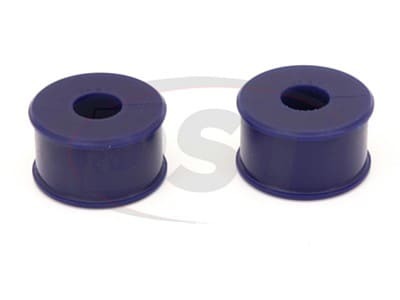 Comments: After looking at the stock replacement part from Honda and what was involved in installing them, I soon decided to purchase these replacement bushings from Energy Suspension and very glad I did. The provided instructions were great, the parts are truly much better than stock and they weren't that hard to install. I honestly cant even explain how great the CRX handles now, but I'm looking forward to replacing all the bushings (worn or not) with Energy Suspension products ! Comments: Perfect fit, excellent part. 100% improvement. Service at energy suspension parts is great!!!! Comments: A must have for any true Honda tuner. I haven't experienced any binding like other people have stated and I push my car. 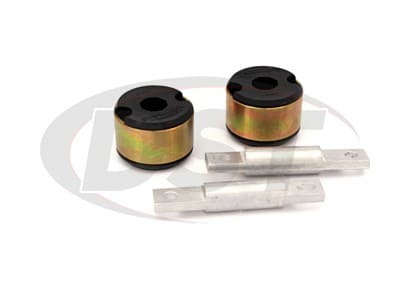 If you have good suspension parts on your civic already(currently running tananbe sustec pro2 coilovers f7 lcas skunk2 camber kit asr 24mm sway bar with asr brace) these bushings will really let u know what your suspension is capable of! Comments: This part looks nice and fits well in place. 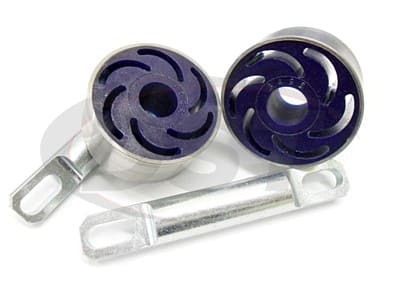 The installation could be easier if the part was supplied with the central support as well as the external ring. These parts are not that easy to remove from the original bushing, which required a lot of work by the mechanic. Comments: With these parts the machines behavior became more clear, the installation of parts does not cause more problems, the good parts. Comments: Better stability of rear axle. Good mounting explanation but so difficult to fit without specialized tools. Comments: I received my order just one week after the purchase on the site. U.S. to "Reunion", it took only 8 days. I am very satisfied with this order! Especially since I did not have the slightest customs fees. Installation was done without major concerns, the OEM was complicated to remove, but the new ones are in place and it is very good! ________________________________________________ Jai reÃ§u ma commande a peine 1 semaine apres lachat sur le site. Des etats unis Ã "La RÃ©union", cela na pris que 8 jours. Je suis trÃ¨s satisfait de cette commande! Dautant plus que je nai pas eu les moindres frais de douane. Le montage sest fait sans soucis majeurs, les OEM cetait compliquÃ© a enlever, mais les nouveaux sont en place et Ã§a tient tres bien! 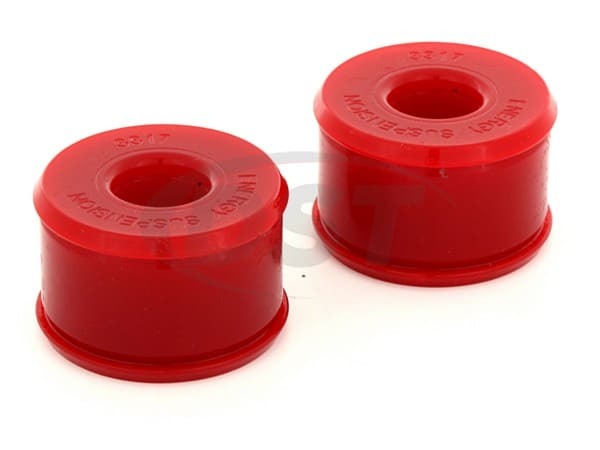 Comments: These bushings have greatly improved my ride quality and are definitely a high quality product. I recommend energy suspension to everyone I know and will keep using them as long as I care about my cars handling. 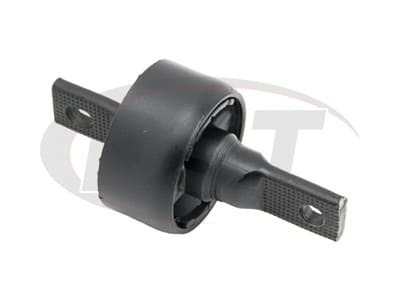 Comments: When ordering the masterkit, you also need to order the trailing arm bushings for optimal result. It is best to get the whole trailing arm out of the car and then fit the bushings. Masterkit and these bushings really improve the handling of the car, car feels better and steering is improved. Comments: Great price & great stuff.. Received & installed nicely.. Comments: Installing them is not the problem... the problem is removing the old ones! But I'm very happy with the results and their performance! Comments: I have not tested part yet, but installation was easy and everything was explained and shown in manual. For extraction I used fire, not cutting which made it a lot easier. I am very happy about bushings. Looks good. Comments: Although the placement did not go completely as foreseen, no real problems were encountered. After I replaced the worst of the original blocs, a test ride revealed a terrific improvement. When both were done, the car rode like a new one. To be recommended. Comments: They fit perfectly and went in with no modifications. Would recommend them to anyone needing these parts for an upgrade.� Great job energy suspension. Comments: I haven't seen any great improvement in the performance of the car since installing these bushings. I have the complete energy suspension kit installed except for the upper rear control arm bushings and this probably might be the cause. Until I change these I will not be able to say outright that they have improved the handling of the car. The greatest plus so far is that my tires do not wear unevenly. Overall with all the energy suspension bushings installed the car performs 100 percent better than before. Comments: Just want to thank you for the great service. Parts were delivered on time plus the installation was easily done. Bushings are the best. Could not of made a better choice. Comments: Not so easy to install. Very good upgrade. Comments: I didn't realize how bad off my old bushings (shot) were until I had these in. Comments: I pray I never have to install another set of these. They are one of the best suspension upgrades you can make to your vehicle, however please learn from my mistake. These come with the hardware (sleeve and crossbar) but because the way Honda bonds the rubber to the metal on the stock units you are prevented from removing the rubber from the old parts with anything other than a good friend, an exacto blade, and 5 hours of free time. Having said that, the part itself is great, and hopefully you know someone who has a hydraulic press to push the old units out and the new ones in. The handling upgrade is phenomenal when added to my new Eibach Sportline shocks and struts and the energy suspension master kit. Its like riding on rails, and the urethane construction should stand up to a lifetime of abuse. Comments: The bushings make the ride stiffer with less play. The only problem I had was the removal of the rear trailing arms to install the bushings. It was difficult and took two days to do both but I also did not have the proper tools to start and the car is 19 years old. Comments: Super stiff. I really like how it reduces my rear from bouncing around like the old worn out oem bushings. Which when it was removed, was ripped completely apart causing the trailing arm to sit free from any restrictions. Energy suspension solved my problem and I highly recommend it for others. Comments: World of difference! A must if you are serious about the suspension on your honda or acura! Comments: This is definietly worth it, I had previously lowered my car and the fact that it was lowered and the stock bushings were 18 years old broke the stock ones. So I figured why replace them with the stock ones which only had two points of contact and tons of flex, I decided to get the Energy Suspension ones and installed them. You can really feel the difference the car sits better and the rear end rides a little stiffer and almost no flex as compared to the stock bushings. I will definietly recommend these to my friends or anyone with a lowered car, one of the best deals out there. I replaced my blown factory bushing and that drum noise in the back is gone, the car feels more high and the handling improved a lot!
. Grease retaining knurling on inner diameter instead of heavy splines.